A study dating from last year revealed that small businesses [those with under 500 employees] use mobile technology to assist with a variety of different functions. When asked how they use smartphones, tablets, and other forms of mobile technology, 73% said they use it for social media marketing, 71% for email marketing, 44% for advertising, 34% for mobile websites, 18% for mobile/tablet based POS systems and 18% to manage operations. 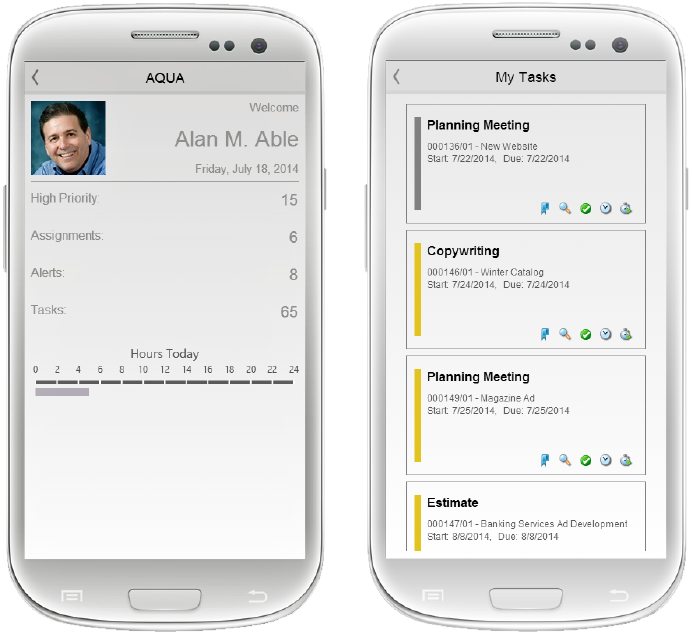 Go mobile with time sheets – grab your smartphone, login to AQUA Advantage and review time sheets on client projects. Even enter your team’s time from the airport lounge. Alerts on-the-go with you – as long as you’re out of the office, you can receive alerts on client projects, deadlines, creative approvals and more. Tasks keep up with you – those tasks will not let you down! Monitor your tasks for all of the assignments that you need to manage while out of the office. For more information on integrating AQUA Advantage and our native mobile applications into your agency, please contact Tina Hussion at tina.hussion@gotoadvantage.com or call 800-841-2078.